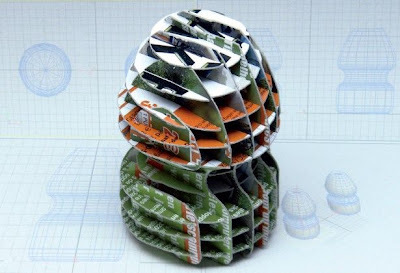 When creating a design for an object like a bottle, you’ll need to make a prototype. Rapid prototyping processes are expensive and require heavy machines and special materials, and clay modelling is not something that’s in every designer’s skillset. Cardboard prototypes are much easier to work with. In the following tutorial we’ll show you the process of making a sliceform prototype. This kind of model costs very little and the only tools you need are a computer, printer, calliper and scissors or scalpel. Many people think you have to calculate and draw each slice to make these sliceform shapes, but there are computer programs that make this process much easier for you. What’s great about this way of prototyping is that you can reshape a model quickly and also use this method for all sorts of different prototypes, not just for packaging. I nominated you for the Brillante Award! Thanks for your creative blog.